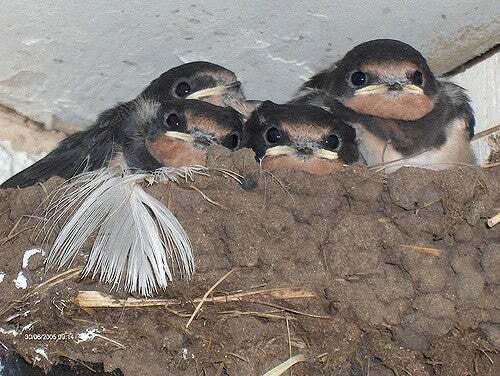 Is it illegal to destroy a swallows’ nest on the wall of our home? NO, IT is illegal as swallows are protected birds, says the wild animal charity Aspas. You may therefore neither destroy their nests nor take their eggs. Doing so can incur a fine of €9,000 and six months’ prison (L.415-3 Code de l’Environnement). Swallows are threatened in France, due to pesticides which poison the insects that they rely on for food. They make considerable use of buildings as sites for their nests and this is encouraged as a way of protecting the species. To avoid problems from swallows you could install a plank under the nest to prevent any droppings falling down onto the building’s facade; it is also possible to purchase artificial nests for swallows to use, which you could install in a spot where the birds are less likely to cause any inconvenience. Let your local council know about the presence of the swallows – it may be able to put out bulletins to other locals about how to protect them. If you know that work on the facade which will disturb the birds, or other measures which will destroy the nests is imminent you could inform those responsible of the legal rules. You could also take photos of the nests. If nests have been destroyed Aspas can help to pursue a prosecution but needs evidence such as ‘before’ and ‘after’ photos, the building’s address and the names of anyone responsible.